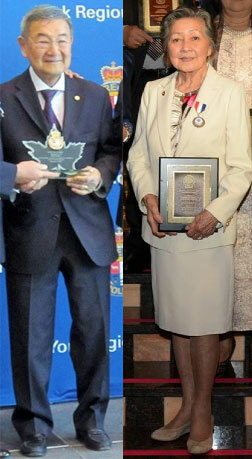 The Canadian Multicultural Council – Asians in Ontario (CMC) recognized 2 prominent Japanese Canadian citizens for their outstanding contributions in our communities. The CMC is an organization comprised of 24 Asian Canadian Associations that promotes Asian heritage and culture as well as participating in charitable fundraising activities for Asian calamities and natural disaster relief efforts. On May 2nd, the York Regional Police Division and the CMC celebrated Asian Heritage Month in Aurora. It was the first Asian Award Presentation to be made by CMC for individuals who have dedicated years of service to CMC. Sid Ikeda, Ambassador of the Japanese Canadian Cultural Centre was the first recipient who has been involved with CMC as a founding member since April 1998. At the presentation, Sid Ikeda talked about his experience coming to Toronto from the internment camps and being able to find the right path to build a good family name, a name that reflects its origins from Japan and now a great name that reflects Canada because of strong work ethics and becoming a contributing citizen of Canada. On May 3rd, the CMC Asian Heritage Month Award Gala honours the pioneers in the Asian communities to 15 recipients for the “2015 Outstanding Asian Canadian Award”. Nominated by the Japanese Canadian Cultural Centre, Kay Fujiwara was recognized who has been “through the most difficult life challenge and comes out with a fiery passion to live and move forward with ardent optimism”. Her drive and extraordinary contributions are evident in her involvement at the Japanese Canadian Cultural Centre community events, fund-raisers, reunions and social functions; her work as a photographer and product stylist within Toronto’s fashion and design industry; her talent as a actress and dancer; and volunteer work with Canadian gymnastics. Since 1998, CMC has operated as a non-profit, non-political umbrella organization to establish inter-cultural cooperation among its members and racial harmony through the understanding of cultures and heritages. Being recognized by CMC, Sid Ikeda and Kay Fujiwara are two individuals that reflects the commitment, care, and community involvement held by many Japanese Canadians. Congratulations to Sid Ikeda and Kay Fujiwara.